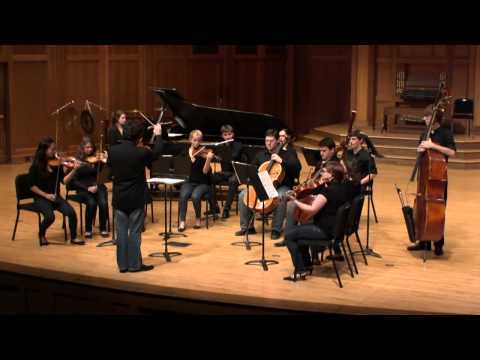 Lawrence University Chamber Orchestra – Sunday, November 3, 2013, 6:30p.m. II. Fast. Sudden burst of arpeggios starts the action. A sentiment both elated and religious gives the keynote to this scene. III. Moderate. Duo for the Bride and her Intended – scene of tenderness and passion. V. Still faster. Solo dance of the Bride – presentiment of motherhood. Extremes of joy and fear and wonder. VI. Very slowly. Transition scenes reminiscent of the introduction. VII. Calm and flowing. Scenes of daily activity for the Bride and her farmer-husband. VIII. Moderate. Coda. The Bride takes her place among her neighbors. At the end, the couple are left quiet and strong in their new house.